I told you yesterday that I bought a Sony Xperia P Smartphone. I was immune for a long Time when it comes to the Smartphone Hype. But over the Time I simply found out what is possible with these Smartphones as Friends told and showed me a lot. Last days I couldn´t resist to get my own Smartphone and I took the Sony Xperia P which is a good Smartphone in my Opinion. However. Last few days I played a lot with my new Smartphone and tested differend Apps. 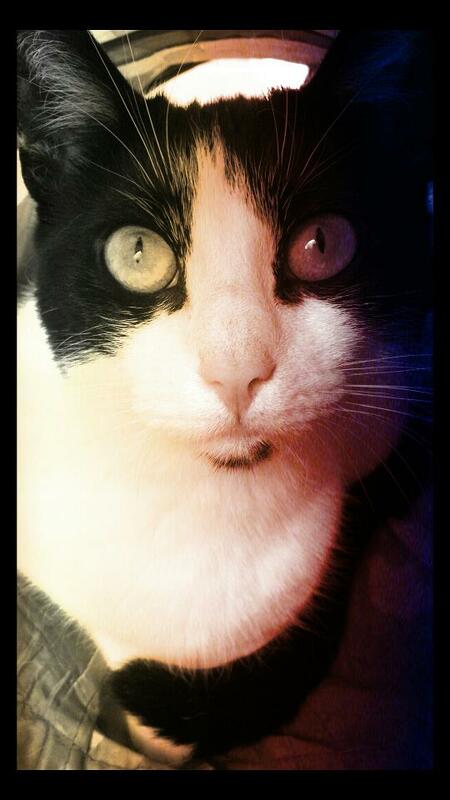 Today I found Pixlr-o-matic which is something like a Photography- and Photo Editing App for your Smartphone. I know there is also Instagram but I decided to use Pixlr-o-matic as the Creators are very well known as professionals when we talk about Graphics Software. I know a lot of Tools from Autodesk. They did create well known professional Desktop Applications like 3dsMax, Maya, AutoCAD, Inventor and so on. I simply thought that Pixlr-o-matic must be better then Instagram even if I can´t compare them as I didn´t use Instagram yet. But I can already say that Pixlr-o-matic is really a funny Android App for fast Photo editing. The last three Days People didn´t see me often without my Android Phone in my Hands. It´s still fresh and I still explore all the new Possibilities. Pixlr-o-matic is one of these Possibilities. It´s a hell of fun. The Photo above is made with my Sony Xperia P when I found my Cat sitting in her Hideout. I edited the Photo with Pixlr-o-matic then and added some fine Filters. This App is pretty interesting and even as a Photoshop User I do like the App and must admit that the Results of the Filters are pretty cool. I would anybody suggest to try out Pixlr-o-matic for Android if you aren´t already using the Tool or any of the alternatives like Instagram. About the Sony Xperia P I just can add that the Camera can take needle-sharp photographs. Really awesome for a Camera which is integrated in a Phone! 8 Megapixel should be way enough for Photos you take when you are outside while you did forget your other Camera. It´s just enough to take cool Snapshots! One thing is sure. I do understand the Smartphone Hype or Trend now. It´s really a nifty Technology! Now I can´t even understand why this Trend didn´t infect me earlier. Is WordPress its quietest on Sundays?